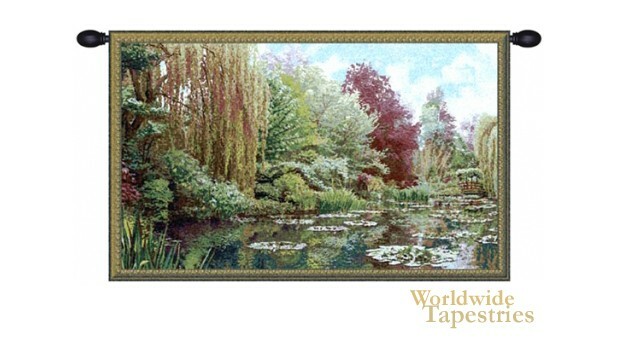 Monet Lake Giverny - Left tapestry shows the gardens of Claude Monet's home. In this part of the larger work, we see the lovely colors of the trees from grey greens, to auburn, to crimson, contrasting with the reflections on the lake abundant with water lilies. The garden was a haven in its aesthetics and a place to relax, and Monet created his original paintings to capture gorgeous moments of his lake and garden in his famous home by the river Seine. This tapestry is backed with a lining and a tunnel for easy hanging. Note: tapestry rods and tassels, where pictured, are not included in the price. Dimensions: W 39" x H 23"